There are a lot of options on how to buy Bitcoin, available in nearly every country of the world from, Gift cards, ATM, local Traders, broker, exchanges: Our ultimate guide explains, how to buy Bitcoin anywhere in the world. Maybe you heard about this crazy cryptocurrency Bitcoin. The future of money, the revolution of payment, the digital gold, slayer of capital controls, holy grail of Fintech. Now you maybe want to know more. The best way to learn is just to try it. Buy a Bitcoin, pay with it, store it in your digital wallet, watch the price rise or go down. But where can you buy it? And how? For many people, the first acquisition of a Bitcoin is a terrifying process. It seems so complicated. But actually, it is not. There are a lot of options to easily, fast and comfortably buy your first Bitcoin. Which one is the best depends on your country and your preferences? If you are in a hurry, you can just click on the link in the table to find out your options on how to buy Bitcoin. How much private information do you want to disclose? Depending on these factors you should easily be able to decide which platform fits your needs. This guide starts with explaining what options you have to disclose private information (or not disclose it) and what payment channels you can use. After this, the guide presents the common methods to buy Bitcoin and gives an overview of several platforms in several countries. Bitcoin is a financial tool and thus subject to financial regulation in most jurisdictions. Nearly everywhere Anti-Money-Laundering-Rules (AML) are applied to platforms that sell Bitcoins or enable users to buy and sell Bitcoins. Most of these platforms have to adopt Know Your Customer rules (KYC) to verify the identity of its users. Since Bitcoin transactions are saved publicly visible on the blockchain and can be traced back, the degree of private information you disclose with buying Bitcoins can have serious implications on your privacy. No KYC: No KYC means that the platform or the seller of Bitcoins does not know who you are. You don‘t have to show an identity document, and you pay with a private means of payment like cash, Moneygram, Paysafecard or Western-Union. 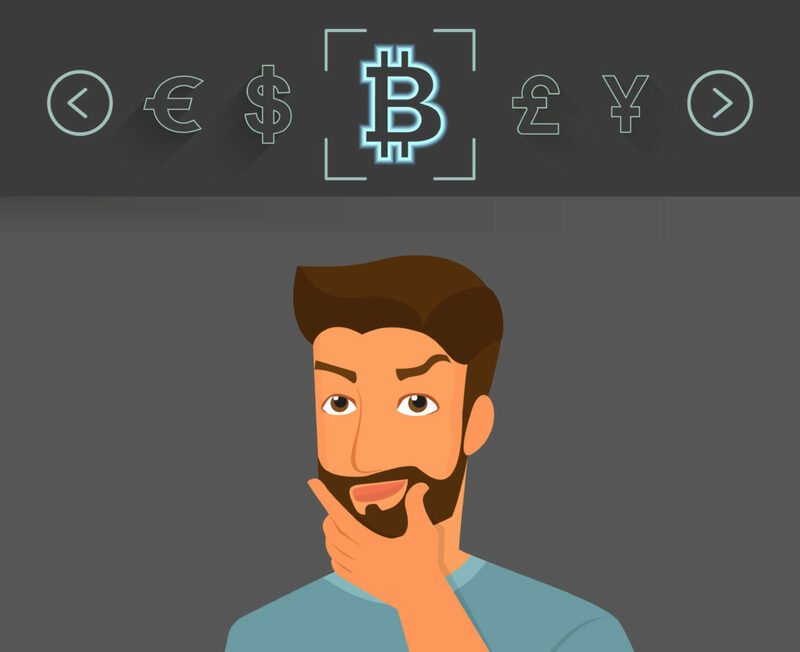 Buying Bitcoin without KYC is possible in some jurisdictions – for example with P2P-marketplaces like LocalBitcoins, ATMs or Gift Cards – but is usually more expensive than other options. 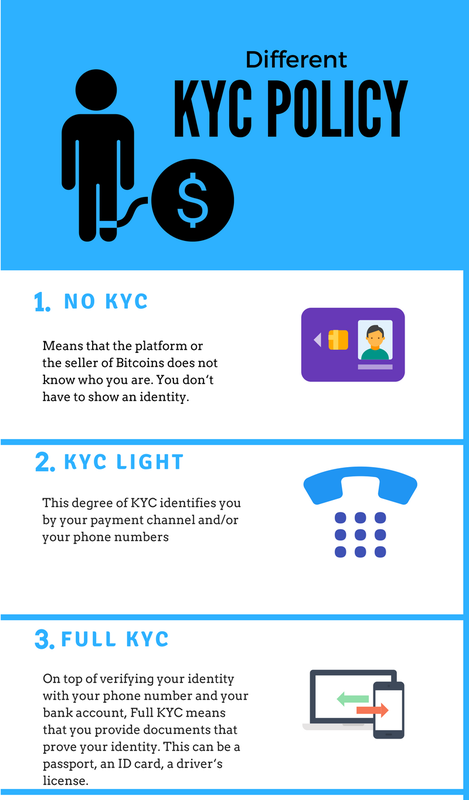 KYC Light: This degree of KYC identifies you by your payment channel and/or your phone numbers. If you pay with your bank account, PayPal, credit card or other common means of payment, the payment providers know your identity. On most platforms, be it direct exchanges, exchange platforms or marketplaces, you can buy a limited amount of Bitcoins with KYC Light. Full KYC: On top of verifying your identity with your phone number and your bank account, Full KYC means that you provide documents that prove your identity. This can be a passport, an ID card, a driver‘s license, a utility bill or a combination of all of this. Some platforms demand that you provide an approval of your identity documents by a notary or a trusted third party like your bank; some are satisfied if you submit a photo showing you holding your ID card or take part in the process of video identification. If you want to invest larger amounts of money or trade on exchanges, there‘s usually no way around Full KYC. Bitcoin is money, but to buy Bitcoins, you need to send money to someone else. The more advanced the financial system of your country is, The better the financial system you live in, the easier it is to exchange your money in Bitcoins. The movement of old fiat-money is the biggest obstacle in the flow of Bitcoin trading. If you use a slow and expensive payment channel, your acquisition of your Bitcoin is slow and expensive. If you use a fast channel, you can buy Bitcoins fluidly. Bank transfer: Everybody might know the good old Bank transfer. Mostly with online banking you send money to a seller of Bitcoins and get the Bitcoins when the payments are done. In most countries, this needs 1-3 days. Direct debiting is usually not accepted common. Most exchange platforms only accept bank transfers. Credit Card: Credit cards are one of the most common means of payment. But only a few direct commercial vendors accept credit cards. The reason is that Bitcoin transactions cannot be undone, while credit card transactions can be reversed. This has resulted in losses for vendors which accepted credit cards. Also, vendors risk that people buy Bitcoin with stolen credit cards.Use Bitcoins to profit from stolen credit card numbers and apply algorithms to reduce the risk. PayPal: A few platforms accept PayPal, but most reject it for the same problems as credit cards: PayPal transactions can be easily undone, and when this is done after the buyer has transferred the acquired Bitcoin to another wallet, the vendor might lose. This is why eBay is a bad place to trade Bitcoins. But, like with credit cards, some platforms accept PayPal. Other Payment Channels (Sofort, iDeal, Skrill…): The world of payment is rich with payment providers. In the EU alone you have dozens of them. Many direct exchanges support a rich collection of them. If you use a common provider, in Germany Sofort, in the Netherlands iDeal and so on, you have a good chance that your domestic direct exchange accepts it. Private Payment Channels (Cash, Western Union, Paysafecard, etc. ): Most commercial platforms don‘t accept these means of payment. You find very few exchange platform and most probably no direct exchange where these payments are accepted. But often you‘ll find a seller on p2p marketplaces you can pay with cash or other private means of payments. A good chance might also be an ATM where you can buy Bitcoins with cash. Now we‘re coming closer to the acquisition of your Bitcoin. In this part of our guide, we present you several common models that enable you to change fiat-money to digital cash – in Bitcoin. Each model has its own advantages and disadvantages. ATM: Maybe the easiest and most private method to acquire Bitcoins is a Bitcoin ATM. You know it, these machines where you can get money with your card. Some companies like Lamassu produce ATM-machines for Bitcoins, where you can buy Bitcoin with cash. If the operators of these machines wish, they can apply some KYC-rules, from mobile phone verification to biometric methods. On Coin-ATM-Radar.com you find a global map with these machines. Another kind of ATM is to just use an existing net of ATMs, like that from banks or train stations, to sell Bitcoins. This has been done for example in the Swiss, in the Ukraine or in Spain. ATMs mostly have a relatively high fee of 3-6 percent or even more. Gift Cards/Voucher: This is another easy method to buy Bitcoins. You go to a kiosk or some other shop, buy a gift card or a voucher, visit a website, where you can use the code on the card to get your Bitcoin. This method is in use for example in Austria, Mexico, and South Korea. Like ATMs, gift cards mostly charge relatively high fees. Direct commercial exchanges/brokers: These vendors are like the exchange offices you might know from an airport, but digital. They buy Bitcoins on an exchange and sell it to customers. You visit a website, choose your means of payment, pay and get Bitcoins for prices set by the platform. For most of these platforms, you need your own wallet, while some, for example, Coinbase and Circle, give you the option to save and spend the Bitcoins with a wallet they provide. Since you can use a great variety of payment channels, even credit cards, and PayPal, such platforms might be the fastest and easiest way for new users to buy their first Bitcoin. The fees of direct commercial exchanges vary between 1 and 5 percent. Some of them earn money by using the spread between buy and sell. Most demand extra fees for some means of payment like credit cards. P2P-Markets: On P2P-marketplaces buyers and sellers of Bitcoin meet and trade with each other. The fees on these markets are relatively low with 0 to 1 percent; the spread depends on the liquidity of the market and the payment channel. Other than with direct you can not only take, but make an offer: You set a price and wait until someone sells you a Bitcoin. This enables you to buy relatively large amounts of Bitcoin at relatively low prices. The most famous P2P-market is LocalBitcoins. This worldwide platform serves a lot of currencies and lets buyers and sellers decide which means of payment they use. It is often used to facilitate anonymous exchanges, sometimes for extraordinarily high prices. Bitcoin.de, the largest P2P-market in the Eurozone offers a good liquidity and is a nice option to easily change Euro to Bitcoin. The third famous P2P market is bitsquare, a completely decentralized market, which is nothing more than a software that connects people. Exchange platforms: If you want to buy regularly large amounts of Bitcoin to good prices or trade with Bitcoins you‘ll most likely choose an exchange platform. Exchanges act as an escrow for its clients and save both Bitcoin and Fiat-money on behalf of their customers. Here you can offer your own orders to buy or sell Bitcoin, and the Their trading engine of the exchanges cumulates these orders and s offers from buyers and sellers and processes trades. Often exchanges have more options to trade like margin trading. Usually, fees and the spread are low. But the process to start an account on exchanges can be complicated, requires privacy disclosing information and needs you to trust the exchange with your money. Despite the proof of identity requirements, remember exchanges and wallets don’t provide the same protections banks do. For example, there is often no or limited insurance for your account if the exchange goes out of business or is robbed by hackers, such as was the case with the infamous failed exchange Mt Gox. Bitcoin does not have legal status as a currency in most of the world, and authorities usually do not know how best to approach thefts. Some larger exchanges have replaced customer funds after a theft from the exchange itself, but at this stage, they are not legally obliged to do so. Exchange: Several exchanges enable the trade with Canadian Dollars. Kraken, QuadrigaCX, and CoinSquare are the most prominent examples. Citizens of Austria can buy Bitcoins with gift cards from bitcoinbon.at that are sold in many traffic shops. This is comfortable, but the relatively expensive method to buy Bitcoins. For Germans, the Fidor-Bank is a good start to buy Bitcoins. This online-bank partners with Bitcoin.de and Kraken, making the trading on these platforms significantly faster and more comfortable. On Bitcoin.de customers of Fidor can immediately achieve full KYC status and use the so-called ExpressTrade. This enables them to buy an unlimited amount of Bitcoins for relatively low prices only minutes after the first contact with the platform. In Spain, you can easily buy Bitcoins at thousands of ATMs with Bit2Me.com and chip-chap.com. Direct: At coined.co.nz you can buy Bitcoins with online bank transfers, at buybitcoin.co.nz with bank deposits. More payment options offer coinhub.nz where you can not only pay with bank transfers but also with cash deposits at ATMs and tellers as with PayPal. mybitcoinsaver.com offers a wallet and the option to invest regularly in Bitcoins with automatic bank transfers. Buying bitcoins is not always as easy as newcomers expect. The good news is the number of options is increasing, and it is getting easier all the time. Use https://bitaccess.co/ in Canada if you have flexipin vouchers. Do you use anything else?